Denzel Washington may have found his next film to direct after the Best Picture-nominated success of Fences, and it would see him teaming up with the Oscar nominated writer of Mudbound. Deadline reports Virgil Williams, who co-wrote Mudbound with Dee Rees, will adapt bestselling memoir A Journal for Jordan with Denzel possibly directing. 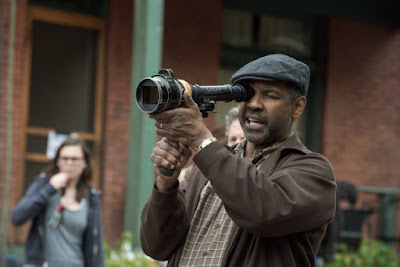 This would be another strong move for Denzel, who is coming off a Best Actor nomination for his performance in Roman J Israel, Esq. The memoir tells the tragic but inspiring story Pulitzer Prize-winning journalist Dana Canedy and her romance with First Sgt. Charles Monroe King, who began a journal of life lessons for their newborn son. After he was deployed to Iraq and killed by a roadside bomb in 2006, those lessons were passed down to the boy who was only 7 months old at the time. Certainly sounds like the stuff Oscars are made of, but I'm interested in seeing if Denzel will also take an acting role in this.